Remember this, “Buried”? Out in cinemas now. Have you caught it? Note: This review contains spoilers. “Buried” may well be the most punishing movie experience of the year. Is that a good thing or a bad thing? Well, that depends on whether your mood is in sync with the picture’s. And this picture has got some seriously dark, nihilistic values at heart. “Buried” never lets up and it never backs down from its unforgiving stance. This is a film that wants you to suffer alongside its protagonist, from beginning to end. There’s an almost misanthropic attitude in how it treats the audience. There are no concessions, no breaks, and definitely no rewards for the viewer at the end of the story. Conceptually, you might appreciate where Spanish director Rodrigo Cortés was coming from. It takes balls of steel to do what he did. But emotionally, you’ll wish he never went there. 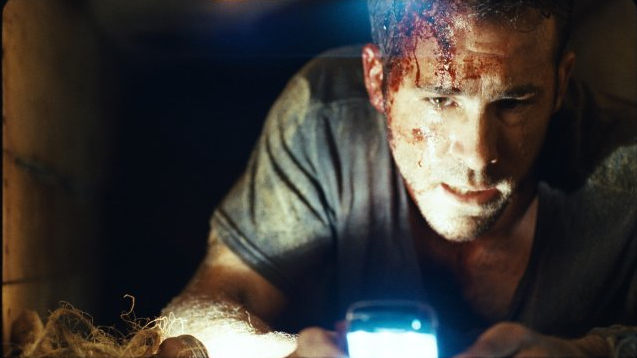 The plot is (very) basically about Paul Conroy (Ryan Reynolds), a contract truck driver in Iraq, who wakes up to find himself several feet under the desert soil, with time and oxygen running out as his captors demand a huge ransom. It’s the stuff of nightmares and phobias. Sounds like it all adds up to a miserable time at the movies. So why would anyone even want to watch it? Because there are things about it to savour. 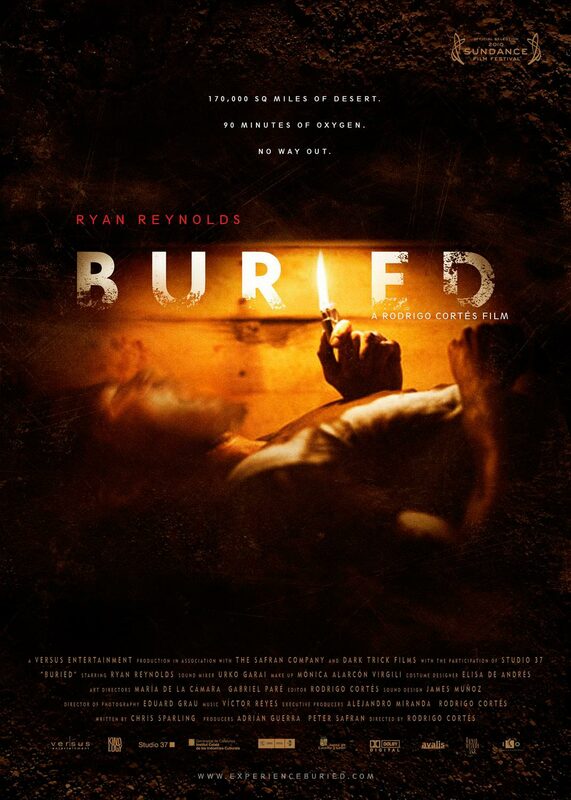 Just in terms of pure filmmaking craftsmanship alone, “Buried” is a pretty well-made film. The entire 90-minute running time is set inside the confines of a 6ft by 3ft coffin. Imagine the difficulty in making a location as limited as this look and feel suitably claustrophobic, without visually wearing the audience out. There literally isn’t much room to maneuver, but Cortés, aided by his Director of Photography Eduard Grau, was thinking (pardon the pun) outside the box. Some shots cleverly use negative black space to reinforce the sense of oppressive nothingness surrounding the trapped hostage. In another scene, the camera slowly pulls skywards away from him, and the walls of the coffin seem to stretch into infinity. The inventive camerawork transforms the coffin into a character in its own right, with a screen presence as tangible as any co-star. In spite of the rather static setting, or possibly thanks to it, the tension never eases off. Screenwriter Chris Sparling constantly raises the stakes until the closing moments. Combined with deft editing, “Buried” has the frantic pace of an action flick. An impressive feat when you stop to consider that 90% of it is just a guy lying down and talking on the phone. Another problem presented by the premise is lighting. Cortés keeps it interesting by switching from a Zippo lighter, to a fluorescent glowstick, to a failing torchlight; and at many points the entire scene is lit by nothing more than the eerie blue glow of a mobile phone screen. If cinematography is the art of painting with light, then “Buried” is a striking exercise in minimalism. Cortés also makes great use of sound design. What he doesn’t allow the audience to see is as effective as what he does reveal. Many moments are pitch dark, with only the ambient noises to inform us of what’s going on. It places the audience right inside the situation with Paul, and the effect is unnerving. But I would’ve preferred it if this gimmick was used more sparingly. After the 3rd or 4th screen blackout, it started to feel a little forced. Ultimately, the best special effect the film has to offer is Ryan Reynolds. Any actor will tell you how hard it is when you’ve got no one in the scene to bounce your performance off. “Acting is reacting”, as the industry saying goes. Reynolds’ character does have many dialogue exchanges with various people, but they’re all off-camera so it’s not the same. For the audience, there is also the danger of overdosing on that one character. Far from outstaying his welcome, Reynolds takes what is on paper a highly-irritating, cardboard cut-out character and renders him as a complex, fully fleshed-out individual. Paul Conroy has your sympathy not just because he’s caught in a terrifying situation. He’s relatable and believable, with just the right hints of vulnerability. That’s all down to the way Reynolds channels the screenplay. It’s a career-defining performance, and I for one would be happy to see his work here acknowledged during awards season. It’s a double-edged sword though. By having such a watchable leading man, the filmmakers have painted themselves into a corner story-wise. After being so deeply invested in this poor man’s struggles, the audience would naturally want a satisfactory resolution. Which brings me back to the point I was making at the beginning of the review. What is satisfactory to you depends on whether you can reconcile your expectations for a typical Hollywood-style emotional payoff with the filmmakers’ own sensibilities. But make no mistake: “Buried” is in every way a horror film. And in horror films, bad things happen to good people, even when we feel it’s totally unfair. There’s an underlying statement about corporate accountability that sums up the film’s very bleak view of humanity. It says a lot when the worst villains aren’t even the ones who could bury a person alive for money. In this particular universe, there is very little faith that good will prevail, and the film’s creators consistently carry that sentiment throughout, right up to its logical conclusion. Hope is what ends up being buried. LB: Storyteller by trade and dreamer by nature, Wai has been deeply nuts about the celluloid world since the first time he discovered he could watch a story instead of reading it. But he likes writing about it. Wai goes by a single name because he likes to avoid any “Imperial entanglements” (a.k.a. “conflict of interest with the powers that be” for those of you who don’t speak Star Wars) in his employment. Plus, cool people use one-word names. Posted on 27 October 2010. You can follow any responses to this entry through the RSS 2.0. 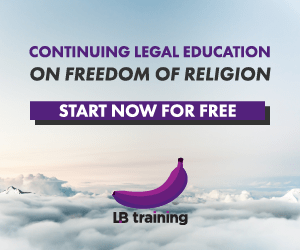 Read more articles posted by Wai. Hi LN, I've watched the first 2 films in Stieg Larsson's Millennium trilogy. I've got "The Girl Who Kicked The Hornet's Nest" on DVD but haven't gotten round to watching it yet. So far, so good though. I find the pace of "The Girl Who Played With Fire" a little more energetic than the first film. But overall, "The Girl With The Dragon Tattoo" is still the most engaging. Noomi Rapace does a brilliant job playing the dark, damaged but gifted Lisbeth Salander. And btw, I really liked "Phone Booth". It was almost like a stage play, in that everything depended on the strength of story and acting. Darnit, now I feel like watching it. I was thinking it must be a little like the other claustrophobic, one-setting movie – remember PHONE BOOTH? I didn't like it much, or maybe I don't like Colin "bad Boy" Farell. Anyway, have you watched the Steig Larsson stuff? i.e Girl with the Dragon Tattoo, Girl Who Started a Fire and Girl Who Kicked the Hornet's Nest? They are GOOD. At first, the DVD uncle gave me dubbed versions. I ran the first DVD and was immediately transported back to the old days when the 5pm belt on TV2 aired "O-shin", a Japanese sob drama dubbed in Malay. I told myself, cannot, cannot – Swedish film must be watched in Swedish. So I hunted them till I found them. It's much better in Swedish (but with English subtitles). Except for Part 2 (Girl Who…Fire), the trilogy is unrelenting in pace. The female protagonist is a really unassuming heroine. And different characters pop up from nowhere but somehow all the ends tie up neatly. Best part is, the movies are all set on the platform of POH LEE TICKS. Angeline, not sure the movie will have quite the same impact on the small screen, and with pauses to break the tension. just watched the movie this morning. was thoroughly freaked out! cortes definitely had an interesting vision and reynolds has finally proven what i've always suspected – that he's got more range than romcoms and action movies. good stuff, but not for everybody. my companion didn't like it. Hey Wai. Now, i'm really curious. Not sure if i have the courage. For me, it's definitely more daunting than watching horror movies.Hahaha. I shall wait for the DVD release. Safer bet so i can take breaks in between. Don't wanna suffer from anxiety attack! Well, on a personal level, this is a much better film than "Legend of the Fist". But many people have expressed dissatisfaction with "Buried" as well, for the reasons stated in my review. As for Four Lions and Lebanon, I have seen them on sale at the local neighbourhood DVD stores. Try SS2. The police are not going to act on the rakyat for having pirated DVDs… yet. As far as I know from the news reports, the gomen is reconsidering this move due to massive objections. Hmmm, funny that. I hope this movie is not going to be like the Legend of the Fist. High expectattions but poor delivery. Also, I cant seem to get DVDs of the movies you recommended like Lebanon and Four Lions. Where do you suggest I try? Also, I read in the newspaper about police stopping people at roadblocks to search cars for pirated DVDs. Is this true? Why are the police like that? We just want to watch movies!